Can someone tell me which RFID tag this module detect? I am a beginner to the Arduino project. Is there any spec (frequency or something like that) that I need to check to see if this module can read. Hi, this is not an RFID reader. For RFID readers and tags check here. If you have any other questions feel free to email techsupport@sparkfun.com. Hi, Can anyone help me on how do I configure the digital I/O passing feature on 2 of these radios. I need to configure 5 digital inputs on the transmitter side which should be translated as 5 digital outputs at the receiver side and send commands to the microcontroller on the receiver module. Please help. Thanks. 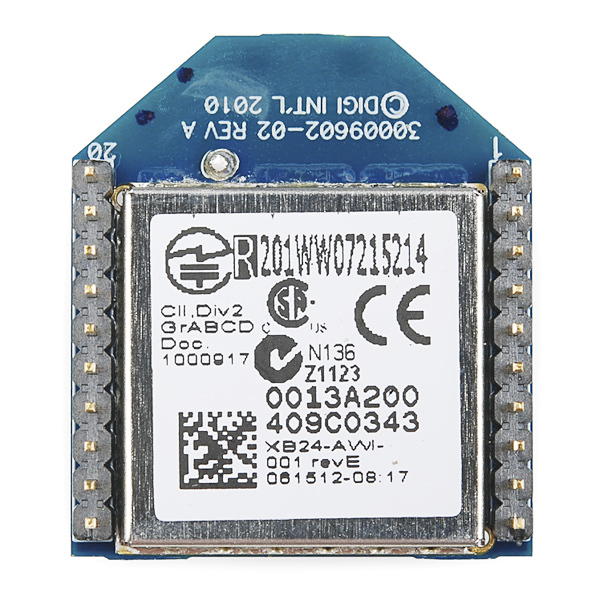 Can this module communicate with xbee wifi module? Thank you. Under X-CTU, you can set each pair of devices to it's own PAN ID (car1, car2 or similar) and they will treat devices of the other PAN (Personal Area Network) as a different network then their own, and ignore it. This ID is also used by SSID for Wifi modules. This can also be done with AT commands. As far as hardware goes, you would need one of the Sparkfun USB adapter boards and a cable to go to the micro USB on the phone. On the arduino side, it would be just a standard xbee setup. For software, you would probably have to write your own app for the phone. Also, the phone would need to able to do and be setup as a USB host device. You would need a OTG cable and capable phone. Also the XBee Explorer USB boards do require drivers, I don't know if FTDI has any for Android so you might have to write the interface yourself as well. 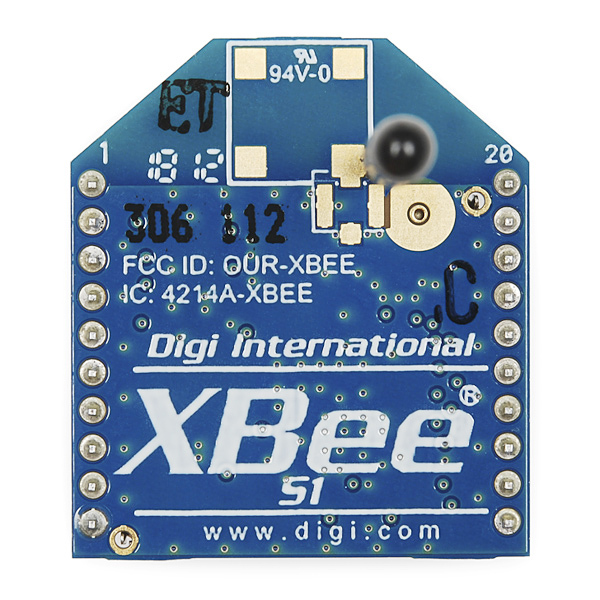 Another option is to connect the XBees to the IOIO board and connect the IOIO to the Android. 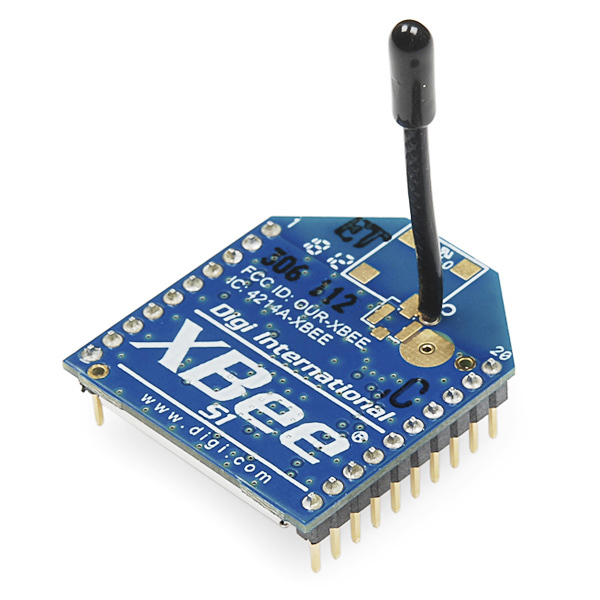 I am using these Xbee modules for my project. 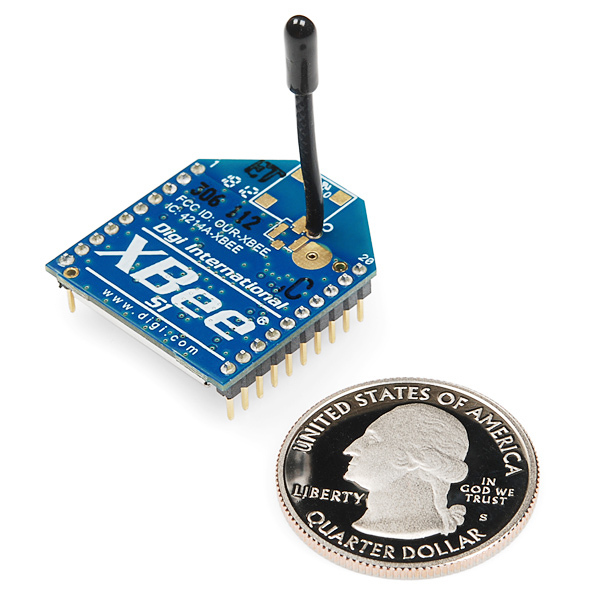 I want to know can these xbee modules be used for multi hopping? for example I have 3 nodes, i want to send data to node 3 from node 1 but node 3 is not in range of node 1 but node 2 is so i send data to node 2 and node 2 send data to node 3.
is there any option like this or i program it into my code ? Basically this is the definition of a mesh network. This is the main feature of Series 2 over Series 1. Unfortunately Series 1 can not do mesh networking. Thank you for your help So is there no way i can do it even if i work in the API mode like if i have the sender and destination address i can route the packet accordingly ? I don't know anyway to have the XBee do it, that doesn't mean you cant have the middle XBee connected to an Arduino which reads all incoming data and reroutes it if necessary. I just bought three of these modules and during configuration of my PAN, and address info (per the chat tutorial off the Digi Examples) I bricked two of the units. They seem to be very sensitive! One appears to be DOA (getting firmware checksum errors) and the other came back and seems ok now. I noticed others have had the same issue and someone gave a link to a tutorial that supposedly tells you how to reset the unit. DO NOT follow those directions! They're not 100% wrong but they bypass some safer procedures (i.e. less likely to wipe your device) you should try first. Instead see Digi's support page. This page has recovery instructions for many different devices made by Digi. For this specific MODEM (e.g. XBee Series 1) reference the section titled XBee (Excluding ZigBee). Note that if you are using the SparkFun USB host board and have to try the last nuclear "hold the reset" while seating the XBee module procedure you will need to wire up a switch (or equivalent) to pins 5 (/RESET) and 10 (GND). See the Datasheet referenced on this product page for pictures etc if you're not sure how to find pins 5 and 10. I just received two units today. The received text file is missing the carriage return/line feed 0x0d/0x0a. I have looked at all the options in TeraTerm and the XBee manual, Does anyone know why these chars are getting lost in the air? An Xbee in transparent mode (default) will pass anything except "(pause) +++ (pause)" so I would check what TeraTerm is sending. Hello! Hey, I'm using Xbees Series 1 and 2B in some projects here. Very cool radios. Anyone have a suggestion about how I might simply interface a Series 1 with a digital potentiometer? Can I do this direct mode, or do I just need to bite the bullet and drop in a minimal ATMega 128 or so ? My need for this particular project is to control a digi pot. from a web interface. Have the dev setup working for the flash slider front end, n/p , but thought I'd ask the smart SparkFun crowd if they had any ideas for the simplest method to achieve simplest digital potentiometer interfacing to Series 1 or 2B. It looks like Series 1 would be better for this application, but any suggestions would be appreciated! I got about a month to iron this out, should work? Anybody done this before? On what manuf's digi pots. should I concentrate? did you get this to work i am trying to do the same thing. have an xbee control a dig pot. Is the antenna on this module simply a wire cut to the correct length? If I needed an antenna for a module that is missing one, could I simply cut a wire of similar gauge and length and solder onto this board? XBee's are not designed or optimized for video, though they're great for controlling a pan/tilt mechanism or another controller that's attached to a webcam. Does anyone know how to fix this error " Unable to communication with modem"? I had 3 of the xbee series 1 and all of them aren't working at all. There's nothing wrong with the xbee chip for sure, because at the first time i try it, it works but what I try to change it. It just stop. Try resetting them. You can see instructions on this at http://www.instructables.com/id/Changing-Xbee-Baud-Rates/. If you still can't communicate, contact us at techsupport at sparkfun dot com. I'm using these for a school engineering project, and I've been through 3 of them (they seem to be quite easy to break), and now that I've gotten two of them working and communicating, it's not reliable at distances over 1m. This seems like a pretty catastrophic failure, any ideas or common mistakes that I could be making? There's no way that these devices would be this popular if they weren't dependable. I have bought 3 Xbee from Sparkfun and UART-USB converter, then I develop own level shifter to communicate with PC, I follow the instruction to write firmware into Xbee (using XCTU modem configuration). At first there is no problem, until at the middle of downloading, error happened and fail. Then I try again, unfortunately, my Xbee cannot be detected. I have try several times still not work until now. I'm sure my Xbee still fine (not burn), the error from downloading make it like this. Anyone have this experience? Please do share with me..
How do I connect this to my computer? Does my computer need an XBEE of its own? Hi, i'm a beginner and I have a question. Can this module be used as a transmiter and receiver? This module is a transceiver and will support two way communication with another identical model (or any other series 1 model). The XBee Explorer USB page has a chart that breaks down the various models. Xbees are standardly set to provide a "transparent" serial pipeline @ 9600Baud so what comes in on the DIN at 9600bauds will come out at the DOUT on other xbees at the same speed. to alter the baud(or other settings) its best to use Digi's X-CTU. Good morning! Please, I want to buy XBee 1mW Wire 4 plates Antenna - Series 1 (802.15.4). You delivery in Brazil and how much? Thank you. I bought this after first purchasing the on chip antenna model. I later found that if you have a PCB with a ground plane under the on chip antenna, it would cause problems. It definitely did! Rather than redesign my PCB, I switched to the wire antenna and it works great. One thing to note, the PWM output on these has a period of 15KHz which is too fast for some microcontrollers to interrupt upon accurately. It will cause a stack overflow at the least. However, you can use a resistor and capacitor filter on the PWM output to make it a stable linear analog voltage for your signal. I use this to control an R2D2 using an analog thumbstick without any issue. I've been learning both the xbee 1 and xbee 2. It is far easier to use the 1 which is very easy to set up in a simple network. I especially appreciate the support videos from Sparkfun. I used them to help pave the way to understanding the xbee protocol. Sparkfun rocks! The range is not really that long as opposed to what is said in the specifications, however it works exactly as it is meant to, which makes it worth every penny.